This coin has Double-Sided Ultra High Relief, meaning that both the obverse and reverse designs use the dramatic Ultra High Relief. Each coin has a gorgeous antique finish that matches the Norse God theme, along with 2 troy ounces of .999 fine silver. The Odin coin is the first release in the 4-coin Norse Gods series, and is legal tender with a $5 face value in the isle of Niue. Using designs created by famous American artists Heidi Wastweet, these coins were minted in Switzerland by the Helvetic Mint. A wooden display box and certificate of authenticity (COA) will be included with the coin to certify its limited worldwide mintage of only 750 coins! In many Nordic and Germanic traditions, Odin is the steward of the underworld, Valhalla, and is often accompanied by his two ravens and a pair of wolves. He is a central figure throughout Norse mythology. Even the day of the week “Wednesday” is his namesake in several languages, from Woden in Old English and Wodan in Old German. 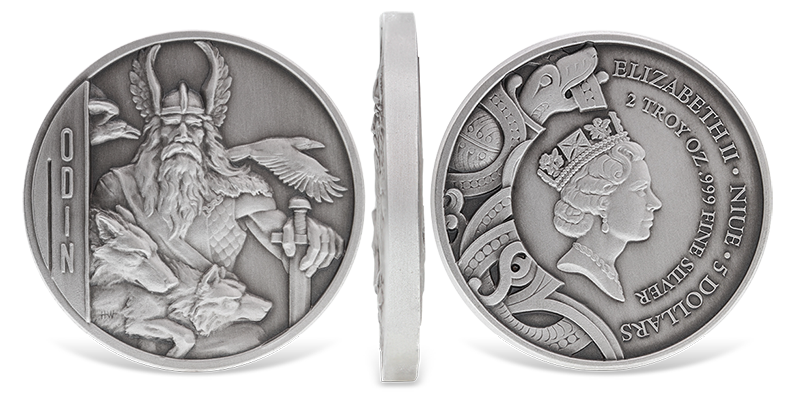 Powerful, wise, and venerated, Odin is now featured on the first of the limited-mintage 4-coin Norse Gods series. Each legal tender coin is struck from .999 fine silver. Subsequent issues in the series will include other prominent deities from the Norse tradition, such as Thor and Loki. Double-Sided Ultra High Relief Silver Coin! Not only does the 2015 Niue $5 Odin - Norse Gods series 2 oz silver coin exhibit a beautiful antique finish, but it also is a legal tender coin with Ultra High Relief on both the obverse and reverse designs! The striking effect of the dramatic relief is combined with the antique finish to give the coin an atmosphere of antiquity while still taking advantage of the most modern minting technology. In addition to reflecting the mint's rigorous quality control and cutting-edge technology, this nickname is fitting: HelveticMint strikes commemorative legal tender coins for several different nations located all around the world, with a particular emphasis on special devices such as ultra high relief, art enameling, pad printing, and even the inlay of precious stones and crystals into coin designs. Both the creative and technical capacities of the HelveticMint know no bounds. HelveticMint truly is a full service “Coin Factory,” assuming responsibility for every step in the process of striking coins, from the original conception of the coin down to its final packaging, including each step in between (designing, engraving, embossing, and minting the coins). Its customers are partners throughout the process, ensuring that innovative ideas and the best marketing solutions always remain part of the program.